A Bill for amendment of the 1999 Constitution to allow creation of states and community police has passed first reading in the Senate.Sponsored by Deputy President of the Senate and Chairman, Committee on Constitution Review, Ike Ekweremadu, the Bill seeks to admit Nigeria into the league of countries operating the state and community police system. Countries already practising the system include United States, United Kingdom, Spain, Mexico, India, Germany, Canada, Brazil and Australia.The Bill titled “Constitution of the Federal Republic of Nigeria (Alteration) Bill, 2018” is co-sponsored by 75 other senators. The proposed law was introduced yesterday barely a week after the chamber asked its Committee on Review of the 1999 Constitution to submit a bill on state police.During a debate on the deteriorating insecurity situation in the country last week, senators described the current centralized policing system in Nigeria as a colossal failure and stressed the urgent need to amend the constitution to allow for state and community police. After the Bill passed first reading yesterday, Ekweremadu who presided over the session, assured that the Senate would expedite action on it. Last week, the Senate approved suggestions and agitations for the creation of state police as a way of strengthening security across the country.The option, which had been canvassed by many, was part of the key recommendations in the 2014 national confab report which President Muhammadu Buhari rejected. 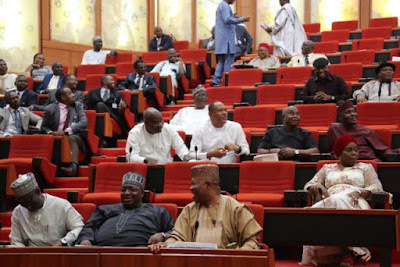 The senators condemned in its entirety the wanton killings in the land and lamented the helplessness of the security agencies , particularly the centralised police force.Jonah Jang, in the motion, said a total of 155 people were killed in the last Plateau attack by herdsmen, out of which 98 were from Mangu Local Government . The former Plateau State governor said the fact that the killings were carried out for several hours by the attackers without any response from any of the security agencies in the centralized security architecture, meant that the time for decentralization of the architecture, particularly that of the police, is now.Ekweremadu, in his contribution to the debate, had said that as long as the country refused to do the needful in terms of state police , the wanton killings in the land would not end.